As reported by Alaska Dispatch News, on the evening of Apr. 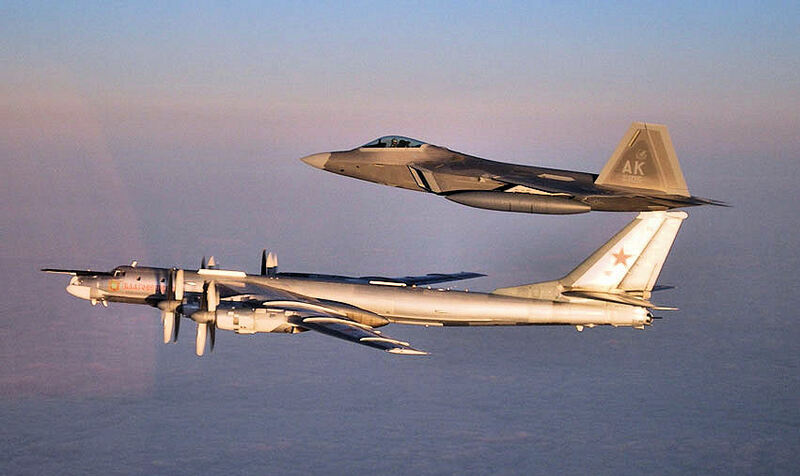 17, 2017 two F-22s were scrambled from Joint Base Elmendorf-Richardson (JBER) to intercept a Russian Tu-95 Bear strategic bomber that was approaching the coast of Alaska. The interception of the bomber took place over the course of about two hours from 6 to 8 p.m., said Lt. Gen. Kenneth Wilsbach, head of both the Alaskan Command and the Alaska NORAD Region. “We were tracking them basically paralleling the Aleutian Islands roughly 100 miles to the south,” he explained. In response, two F-22 Raptor stealth fighters, supported by an E-3 from Elmendorf and a KC-135 from Eielson Air Force Base, were scrambled from JBER. The fighters intercepted the Bear about 100 miles southwest of Kodiak, told Wilsbach. Noteworthy the bomber was unarmed and no verbal contact took place between the Bear and fighters crews. Both the American and Russian aircraft were flying “in accordance with international airspace and international law,” Wilsbach said. According to Wilsbach this kind of incident is an indicator of the value of Northern Edge exercise set for this summer in the Gulf of Alaska: in fact the drill includes simulated intercepts similar to the one that has involved the Bear. Although such intercepts have taken place in the past, this is the first time such kind of intercept took place since President Donald Trump took office.